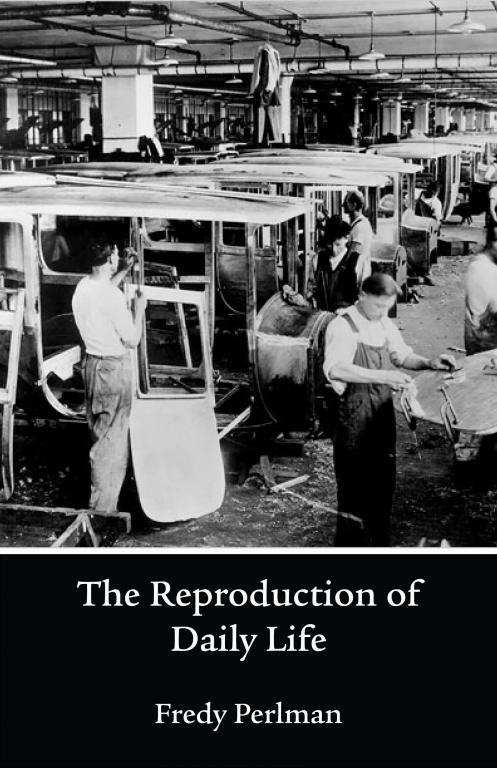 Fredy Perlman's excellent analysis of alienation and the way in which we as workers reproduce the capitalist economy in our everyday lives. The everyday practical activity of tribesmen reproduces, or perpetuates, a tribe. This reproduction is not merely physical, but social as well. Through their daily activities the tribesmen do not merely reproduce a group of human beings; they reproduce a tribe, namely a particular social form within which this group of human beings performs specific activities in a specific manner. The specific activities of the tribesmen are not the outcome of "natural" characteristics of the men who perform them, the way the production of honey is an outcome of the "nature" of a bee. The daily life enacted and perpetuated by the tribesman is a specific social response to particular material and historical conditions. The everyday activity of slaves reproduces slavery. Through their daily activities, slaves do not merely reproduce themselves and their masters physically; they also reproduce the instruments with which the master represses them, and their own habits of submission to the master's authority. To men who live in a slave society, the master-slave relation seems like a natural and eternal relation. However, men are not born masters or slaves. Slavery is a specific social form, and men submit to it only in very particular material and historical conditions. The practical everyday activity of wage-workers reproduces wage labor and capital. Through their daily activities, "modern" men, like tribesmen and slaves, reproduce the inhabitants, the social relations and the ideas of their society; they reproduce the social form of daily life. Like the tribe and the slave system, the capitalist system is neither the natural nor the final form of human society; like the earlier social forms, capitalism is a specific response to material and historical conditions . Unlike earlier forms of social activity, everyday life in capitalist society systematically transforms the material conditions to which capitalism originally responded. Some of the material limits to human activity come gradually under human control. At a high level of industrialization, practical activity creates its own material conditions as well as its social form. Thus the subject of analysis is not only how practical activity in capitalist society reproduces capitalist society, but also how this activity itself eliminates the material conditions to which capitalism is a response. The social form of people's regular activities under capitalism is a response to a certain material and historical situation. The material and historical conditions explain the origin of the capitalist form, but do not explain why this form continues after the initial situation disappears. A concept of "cultural lag" is not an explanation of the continuity of a social form after the disappearance of the initial conditions to which it responded. This concept is merely a name for the continuity of the social form. When the concept of "cultural lag" parades as a name for a "social force" which determines human activity, it is an obfuscation which presents the outcome of people's activities as an external force beyond their control. This is not only true of a concept like "cultural lag." Many of the terms used by Marx to describe people's activities have been raised to the status of external and even "natural" forces which determine people's activity; thus concepts like "class struggle," "production relations" and particularly "The Dialectic," play the same role in the theories of some "Marxists" that "Original Sin," "Fate" and "The Hand of Destiny" played in the theories of medieval mystifiers. In the performance of their daily activities, the members of capitalist society simultaneously carry out two processes: they reproduce the form of their activities, and they eliminate the material conditions to which this form of activity initially responded. But they do not know they carry out these processes; their own activities are not transparent to them. They are under the illusion that their activities are responses to natural conditions beyond their control and do not see that they are themselves authors of those conditions. The task of capitalist ideology is to maintain the veil which keeps people from seeing that their own activities reproduce the form of their daily life; the task of critical theory is to unveil the activities of daily life, to render them transparent, to make the reproduction of the social form of capitalist activity visible within people's daily activities. Under capitalism, daily life consists of related activities which reproduce and expand the capitalist form of social activity. The sale of labor-time for a price (a wage), the embodiment of labor time in commodities (saleable goods, both tangible and intangible), the consumption of tangible and intangible commodities (such as consumer goods and spectacles)-these activities which characterize daily life under capitalism are not manifestations of "human nature," nor are they imposed on men by forces beyond their control. If it is held that man is "by nature" an uninventive tribesman and an inventive businessman, a submissive slave and a proud craftsman an independent hunter and a dependent wage-worker, then either man's "nature" is an empty concept, or man's "nature'' depends on material and historical conditions, and is in fact a response to those conditions. In capitalist society, creative activity takes the form of commodity production, market production of marketable goods, and the results of human activity take the form of commodities. Marketability or saleability is the universal characteristic of all practical activity and all products. The products of human activity which are necessary for survival have the form of saleable goods: they are only available in exchange for money. And money is only available in exchange for commodities. If a large number of men accept the legitimacy of these conventions, if they accept the convention that commodities are a prerequisite for money, and that money is a prerequisite for survival, then they find themselves locked into a vicious circle. Since they have no commodities, their only exit from this circle is to regard themselves, or parts of themselves, as commodities. And this is, in fact, the peculiar "solution" which men impose on themselves in the face of specific material and historical conditions. They do not exchange their bodies or parts of their bodies for money. They exchange the creative content of their lives, their practical daily activity, for money. As soon as men accept money as an equivalent for life, the sale of living activity becomes a condition for their physical and social survival. Life is exchanged for survival. Creation and production come to mean sold activity. A man's activity is "productive," useful to society, only when it is sold activity. And the man himself is a productive member of society only if the activities of his daily life are sold activities. As soon as people accept the terms of this exchange, daily activity takes the form of universal prostitution. The sold creative power, or sold daily activity, takes the form of labor. Labor is a historically specific form of human activity. Labor is abstract activity which has only one property: it is marketable, it can be sold for a given quantity of money. Labor is indifferent activity: indifferent to the particular task performed and indifferent to the particular subject to which the task is directed. Digging, printing and carving are different activities, but all three are labor in capitalist society. Labor is simply "earning money." Living activity which takes the form of labor is a means to earn money. Life becomes a means of survival. This ironic reversal is not the dramatic climax of an imaginative novel; it is a fact of daily life in capitalist society. Survival, namely self-preservation and reproduction, is not the means to creative practical activity, but precisely the other way around. Creative activity in the form of labor, namely sold activity, is a painful necessity for survival; labor is the means to selfpreservation and reproduction. The sale of living activity brings about another reversal. Through sale, the labor of an individual becomes the "property" of another, it is appropriated by another, it comes under the control of another. In other words, a person's activity becomes the activity of another, the activity of its owner; it becomes alien to the person who performs it. Thus one's life, the accomplishments of an individual in the world, the difference which his life makes in the life of humanity, are not only transformed into labor, a painful condition for survival; they are transformed into alien activity, activity performed by the buyer of that 1abor. In capitalist society, the architects, the engineers, the laborers, are not builders; the man who buys their labor is the builder; their projects, calculations and motions are alien to them; their living activity, their accomplishments, are his. Academic sociologists, who take the sale of labor for granted, understand this alienation of labor as a feeling: the worker's activity "appears" alien to the worker, it "seems" to be controlled by another. However, any worker can explain to the academic sociologists that the alienation is neither a feeling nor an idea in the worker's head, but a real fact about the worker's daily life. The sold activity is in fact alien to the worker; his labor is in fact controlled by its buyer. In exchange for his sold activity, the worker gets money, the conventionally accepted means of survival in capitalist society. With this money he can buy commodities, things, but he cannot buy back his activity. This reveals a peculiar "gap" in money as the "universal equivalent." A person can sell commodities for money, and he can buy the same commodities with money. He can sell his living activity for money, but he cannot buy his living activity for money. By alienating their activity and embodying it in commodities, in material receptacles of human labor, people reproduce themselves and create Capital. From the standpoint of capitalist ideology, and particularly of academic Economics, this statement is untrue: commodities are "not the product of labor alone"; they are produced by the primordial "factors of production," Land, Labor and Capital, the capitalist Holy Trinity, and the main "factor" is obviously the hero of the piece, Capital. The purpose of this superficial Trinity is not analysis, since analysis is not what these Experts are paid for. They are paid to obfuscate, to mask the social form of practical activity under capitalism, to veil the fact that producers reproduce themselves, their exploiters, as well as the instruments with which they're exploited. The Trinity formula does not succeed in convincing. It is obvious that land is no more of a commodity producer than water, air, or the sun. Furthermore Capital, which is at once a name for a social relation between workers and capitalists, for the instruments of production owned by a capitalist, and for the money-equivalent of his instruments and "intangibles," does not produce anything more than the ejaculations shaped into publishable form by the academic Economists. Even the instruments of production which are the capital of one capitalist are primordial "factors of production" only if one's blinders limit his view to an isolated capitalist firm, since a view of the entire economy reveals that the capital of one capitalist is the material receptacle of the labor alienated to another capitalist. However, though the Trinity formula does not convince, it does accomplish the task of obfuscation by shifting the subject of the question: instead of asking why the activity of people under capitalism takes the form of wage-labor, potential analysts of capitalist daily life are transformed into academic house-Marxists who ask whether or not labor is the only "factor of production." Thus Economics (and capitalist ideology in general) treats land, money, and the products of labor, as things which have the power to produce, to create value, to work for their owners, to transform the world. This is what Marx called the fetishism which characterizes people's everyday conceptions, and which is raised to the level of dogma by Economics. For the economist, living people are things ("factors of production"), and things live (money "works," Capital "produces"). The fetish worshipper attributes the product of his own activity to his fetish. As a result, he ceases to exert his own power (the power to transform nature, the power to determine the form and content of his daily life); he exerts only those "powers" which he attributes to his fetish (the "power" to buy commodities). In other words, the fetish worshipper emasculates himself and attributes virility to his fetish. But the fetish is a dead thing, not a living being; it has no virility. The fetish is no more than a thing for which, and through which, capitalist relations are maintained. The mysterious power of Capital, its "power" to produce, its virility, does not reside in itself, but in the fact that people alienate their creative activity, that they sell their labor to capitalists, that they materialize or reify their alienated labor in commodities. In other words, people are bought with the products of their own activity, yet they see their own activity as the activity of Capital, and their own products as the products of Capital. By attributing creative power to Capital and not to their own activity, they renounce their living activity, their everyday life, to Capital, which means that people give themselves daily, to the personification of Capital, the capitalist. By selling their labor, by alienating their activity, people daily reproduce the personifications of the dominant forms of activity under capitalism, they reproduce the wage-laborer and the capitalist. They do not merely reproduce the individuals physically, but socially as well; they reproduce individuals who are sellers of labor-power, and individuals who are owners of means of production; they reproduce the individuals as well as the specific activities, the sale as well as the ownership. Every time people perform an activity they have not themselves defined and do not control, every time they pay for goods they produced with money they received in exchange for their alienated activity, every time they passively admire the products of their own activity as alien objects procured by their money, they give new life to Capital and annihilate their own lives. The aim of the process is the reproduction of the relation between the worker and the capitalist. However, this is not the aim of the individual agents engaged in it. Their activities are not transparent to them; their eyes are fixed on the fetish that stands between the act and its result. The individual agents keep their eyes fixed on things, precisely those things for which capitalist relations are established. The worker as producer aims to exchange his daily labor for money-wages, he aims precisely for the thing through which his relation to the capitalist is re established, the thing through which he reproduces himself as a wage- worker and the other as a capitalist. The worker as consumer exchanges his money for products of labor, precisely the things which the capitalist has to sell in order to realize his Capital. The daily transformation of living activity into Capital is mediated by things, it is not carried out by the things. The fetish worshipper does not know this; for him labor and land, instruments and money, entrepreneurs and bankers, are all "factors" and "agents." When a hunter wearing an amulet downs a deer with a stone, he may consider the amulet an essential "factor" in downing the deer and even in providing the deer as an object to be downed. If he is a responsible and well-educated fetish worshipper, he will devote his attention to his amulet, nourishing it with care and admiration; in order to improve the material conditions of his life, he will improve the way he wears his fetish, not the way he throws the stone; in a bind, he may even send his amulet to "hunt" for him. His own daily activities are not transparent to him: when he eats well, he fails to see that it is his own action of throwing the stone, and not the action of the amulet, that provided his food; when he starves, he fails to See that it is his own action of worshipping the amulet instead of hunting, and not the wrath of his fetish, that causes his starvation. The fetishism of commodities and money, the mystification of one's daily activities, the religion of everyday life which attributes living activity to inanimate things, is not a mental caprice born in men's imaginations; it has its origin in the character of social relations under capitalism. Men do in fact relate to each other through things; the fetish is in fact the occasion for which they act collectively, and through which they reproduce their activity. But it is not the fetish that performs the activity. It is not Capital that transforms raw materials, nor Capital that produces goods. If living activity did not transform the materials, these would remain untransformed, inert, dead matter. If men were not disposed to continue selling their living activity, the impotence of Capital would be revealed; Capital would cease to exist; its last remaining potency would be the power to remind people of a bypassed form of everyday life characterized by daily universal prostitution. The worker alienates his life in order to preserve his life. If he did not sell his living activity he could not get a wage and could not survive. However, it is not the wage that makes alienation the condition for survival. If men were collectively not disposed to sell their lives, if they were disposed to take control over their own activities, universal prostitution would not be a condition for survival. It is people's disposition to continue selling their labor, and not the things for which they sell it, that makes the alienation of living activity necessary for the preservation of life. The living activity sold by the worker is bought by the capitalist. And it is only this living activity that breathes life into Capital and makes it "productive." The capitalist, an "owner" of raw materials and instruments of production, presents natural objects and products of other people's labor as his own "private property. But it is not the mysterious power of Capital that creates the capitalist's "private property" ;living activity is what creates the "property," and the form of that activity is what keeps it "private." The transformation of living activity into Capital takes place through things, daily, but is not carried out by things. Things which are products of human activity seem to be active agents because activities and contacts are established for and through things, and because people's activities are not transparent to them; they confuse the mediating object with the cause. In the capitalist process of production, the worker embodies or materializes his alienated living energy in an inert object by using instruments which are embodiments of other people's activity. (Sophisticated industrial instruments embody the intellectual and manual activity of countless generations of inventors, improvers and producers from all corners of the globe and from varied forms of society.) The instruments in themselves are inert objects; they are material embodiments of living activity, but are not themselves alive. The only active agent in the production process is the living laborer. He uses the products of other people's labor and infuses them with life, so to speak, but the life is his own; he is not able to resurrect the individuals who stored their living activity in his instrument. The instrument may enable him to do more during a given time period, and in this sense it may raise his productivity. But only the living labor which is able to produce can be productive. For example, when an industrial worker runs an electric lathe, he uses products of the labor of generations of physicists, inventors, electrical engineers, lathe makers. He is obviously more productive than a craftsman who carves the same object by hand. But it is in no sense the "Capital" at the disposal of the industrial worker which is more "productive" than the "Capital'' of the craftsman. If generations of intellectual and manual activity had not been embodied in the electric lathe, if the industrial worker had to invent the lathe, electricity, and the electric lathe, then it would take him numerous lifetimes to turn a single object on an electric lathe, and no amount of Capital could raise his productivity above that of the craftsman who carves the object by hand. The notion of the "productivity of capital," and particularly the detailed measurement of that "productivity," are inventions of the "science" of Economics, that religion of capitalist daily life which uses up people's energy in the worship, admiration and flattery of the central fetish of capitalist society. Medieval colleagues of these "scientists" performed detailed measurements of the height and width of angels in Heaven, without ever asking what angels or Heaven were, and taking for granted the existence of both. What the worker produces under capitalist conditions is a product with a very specific property, the property of saleability. What his alienated activity produces is a commodity. Because capitalist production is commodity production, the statement that the goal of the process is the satisfaction of human needs is false; it is a rationalization and an apology. The "satisfaction of human needs" is not the goal of the capitalist or of the worker engaged in production, nor is it a result of the process. The worker sells his labor in order to get a wage; the specific content of the labor is indifferent to him; he does not alienate his labor to a capitalist who does not give him a wage in exchange for it, no matter how many human needs this capitalist's products may satisfy. The capitalist buys labor and engages it in production in order to emerge with commodities which can be sold. He is indifferent to the specific properties of the product, just as he is indifferent to people's needs; all that interests him about the product is how much it will sell for, and all that interests him about people's needs is how much they "need" to buy and how they can be coerced, through propaganda and psychological conditioning, to "need" more. The capitalist's goal Is to satisfy his need to reproduce and enlarge Capital, and the result of the process is the expanded reproduction of wage labor and Capital (which are not "human needs"). The commodity produced by the worker is exchanged by the capitalist for a specific quantity of money; the commodity is a value which is exchanged for an equivalent value. In other words, the living and past labor materialized in the product can exist in two distinct yet equivalent forms, in commodities and in money, or in what is common to both, value. This does not mean that value is labor. Value is the social form of reified (materialized) labor in capitalist society. Under capitalism, social relations are not established directly; they are established through value. Everyday activity is not exchanged directly; it is exchanged In the form of value. Consequently, what happens to living activity under capitalism cannot be traced by observing the activity itself, but only by following the metamorphoses of value. When the living activity of people takes the form of labor (alienated activity), it acquires the property of exchangeability; it acquires the form of value. In other words, the labor can be exchanged for an "equivalent" quantity of money (wages). The deliberate alienation of living activity, which is perceived as necessary for survival by the members of capitalist society, itself reproduces the capitalist form within which alienation is necessary for survival. Because of the fact that living activity has the form of value, the products of that activity must also have the form of value: they must be exchangeable for money. This is obvious since, if the products of labor did not take the form of value, but for example the form of useful objects at the disposal of society, then they would either remain in the factory or they would be taken freely by the members of society whenever a need for them arose; in either case, the money-wages received by the workers would have no value, and living activity could not be sold for an "equivalent" quantity of money; living activity could not be alienated. Consequently, as soon as living activity takes the form of value, the products of that activity take the form of value, and the reproduction of everyday life takes place through changes or metamorphoses of value. The capitalist sells the products of labor on a market; he exchanges them for an equivalent sum of money; he realizes a determined value. The specific magnitude of this value on a particular market is the price of the commodities. For the academic Economist, Price is St. Peter's key to the gates of Heaven. Like Capital itself, Price moves within a wonderful world which consists entirely of objects; the objects have human relations with each other, and are alive; they transform each other, communicate with each other; they marry and have children. And of course it is only through the grace of these intelligent, powerful and creative objects that people can be so happy in capitalist society. In the Economist's pictorial representations of the workings of heaven, the angels do everything and men do nothing at all; men simply enjoy what these superior beings do for them. Not only does Capital produce and money work; other mysterious beings have similar virtues. Thus Supply, a quantity of things which are sold, and Demand, a quantity of things which are bought, together determine Price, a quantity of money; when Supply and Demand marry on a particular point of the diagram, they give birth to Equilibrium Price, which corresponds to a universal state of bliss. The activities of everyday life are played out by things, and people are reduced to things ("factors of production") during their productive" hours, and to passive spectators of things during their "leisure time." The virtue of the Economic Scientist consists of his ability to attribute the outcome of people's everyday activities to things, and of his inability to see the living activity of people underneath the antics of the things. For the Economist, the things through which the activity of people is regulated under capitalism are themselves the mothers and sons, the causes and consequences of their own activity. The magnitude of value, namely the price of a commodity, the quantity of money for which it exchanges, is not determined by things, but by the daily activities of people. Supply and demand, perfect and imperfect competition, are nothing more than social forms of products and activities in capitalist society; they have no life of their own. The fact that activity is alienated, namely that labor-time is sold for a specific sum of money, that it has a certain value, has several consequences for the magnitude of the value of the products of that labor. The value of the sold commodities must at least be equal to the value of the labor-time. This is obvious both from the standpoint of the individual capitalist firm, and from the standpoint of society as a whole. If the value of the commodities sold by the individual capitalist were smaller than the value of the labor he hired, then his labor expenditures alone would be larger than his earnings, and he would quickly go bankrupt. Socially, if the value of the laborers production were smaller than the value of their consumption, then the labor force could not even reproduce itself, not to speak of a class of capitalists. However, if the value of the commodities were merely equal to the value of the labor- time expended on them, the commodity producers would merely reproduce themselves, and their society would not be a capitalist society; their activity might still consist of commodity production, but it would not be capitalist commodity production. For labor to create Capital, the value of the products of labor must be larger than the value of the labor. In other words, the labor force must produce a surplus product, a quantity of goods which it does not consume, and this surplus product must be transformed into surplus value, a form of value which is not appropriated by workers as wages, but by capitalists as profit. Furthermore, the value of the products of labor must be larger still, since living labor is not the only kind of labor materialized in them. In the production process, workers expend their own energy, but they also use up the stored labor of others as instruments, and they shape materials on which labor was previously expended. This leads to the strange result that the value of the laborer's products and the value of his wage are different magnitudes, namely that the sum of money received by the capitalist when he sells the commodities produced by his hired laborers is different from the sum he pays the laborers. This difference is not explained by the fact that the used- up materials and tools must be paid for. If the value of the sold commodities were equal to the value of the living labor and the instruments, there would still be no room for capitalists. The fact is that the difference between the two magnitudes must be large enough to support a class of capitalists-not only the individuals, but also the specific activity that these individuals engage in, namely the purchase of labor. The difference between the total value of the products and the value of the labor spent on their production is surplus value, the seed of Capital. In order to locate the origin of surplus value, it is necessary to examine why the value of the labor is smaller than the value of the commodities produced by it. The alienated activity of the worker transforms materials with the aid of instruments, and produces a certain quantity of commodities. However, when these commodities are sold and the used-up materials and instruments are paid for, the workers are not given the remaining value of their products as their wages; they are given less. In other words, during every working day, the workers perform a certain quantity of unpaid labor, forced label, for which they receive no equivalent. The performance of this unpaid labor, this forced labor, is another "condition for survival" in capitalist society. However, like alienation, this condition is not imposed by nature, but by the collective practice of people, by their everyday activities. Before the existence of unions, an individual worker accepted whatever forced labor was available, since rejection of the labor would have meant that other workers would accept the available terms of exchange, and the individual worker would receive no wage. Workers competed with each other for the wages offered by capitalists; if a worker quit because the wage was unacceptably low, an unemployed worker was willing to replace him, since for the unemployed a small wage is higher than no wage at all. This competition among workers was called "free labor" by capitalists, who made great sacrifices to maintain the freedom of workers, since it was precisely this freedom that preserved the surplus value of the capitalist and made it possible for him to accumulate Capital. It was not any worker's aim to produce more goods than he was paid for. His aim was to get a wage which was as large as possible. However, the existence of workers who got no wage at all, and whose conception of a large wage was consequently more modest than that of an employed worker, made it possible for the capitalist to hire labor at a lower wage. In fact, the existence of unemployed workers made it possible for the capitalist to pay the lowest wage that workers were willing to work for. Thus the result of the collective daily activity of the workers, each striving individually for the largest possible wage, was to lower the wages of all; the effect of the competition of each against all was that all got the smallest possible wage, and the capitalist got the largest possible surplus. The daily practice of all annuls the goals of each. But the workers did not know that their situation was a product of their own daily behavior; their own activities were not transparent to them. To the workers it seemed that low wages were simply a natural part of life, like illness and death, and that falling wages were a natural catastrophe, like a flood or a hard winter. The critiques of socialists and the analyses of Marx, as well as an increase in industrial development which afforded more time for reflection, stripped away some of the veils and made it possible for workers to see through their activities to some extent. However, in Western Europe and the United States, workers did not get rid of the capitalist form of daily life; they formed unions. And in the different material conditions of the Soviet Union and Eastern Europe, workers (and peasants) replaced the capitalist class with a state bureaucracy that purchases alienated labor and accumulates Capital in the name of Marx. With unions, daily life is similar to what it was before unions. in fact, it is almost the same. Daily life continues to consist of labor, of alienated activity, and of unpaid labor, or forced labor. The unionized worker no longer settles the terms of his alienation; union functionaries do this for him. The terms on which the worker's activity is alienated are no longer guided by the individual worker's need to accept what is available; they are now guided by the union bureaucrat's need to maintain his position as pimp between the sellers of labor and the buyers. With or without unions, surplus value is neither a product of nature nor of Capital; it is created by the daily activities of people. In the performance of their daily activities, people are not only disposed to alienate these activities, they are also disposed to reproduce the conditions which force them to alienate their activities, to reproduce Capital and thus the power of Capital to purchase labor. This is not because they do not know "what the alternative is." A person who is incapacitated by chronic indigestion because he eats too much grease does not continue eating grease because he does not know what the alternative is. Either he prefers being incapacitated to giving up grease, or else it is not clear to him that his daily consumption of grease causes his incapacity. And if his doctor, preacher, teacher and politician tell him, first, that the grease is what keeps him alive, and secondly that they already do for him everything he would do if he were well, then it is not surprising that his activity is not transparent to him and that he makes no great effort to render it transparent. The production of surplus value is a condition of survival, not for the population, but for the capitalist system. Surplus value is the portion of the value of commodities produced by labor which is not returned to the laborers. It can be expressed either in commodities or in money (just as Capital can be expressed either as a quantity of things or of money), but this does not alter the fact that it is an expression for the materialized labor which is stored in a given quantity of products. Since the products can be exchanged for an "equivalent" quantity of money, the money "stands for", or represents, the same value as the products. The money can, in turn, be exchanged for another quantity of products of "equivalent" value. The ensemble of these exchanges, which take place simultaneously during the performance of capitalist daily life, constitutes the capitalist process of circulation. It is through this process that the metamorphosis of surplus value into Capital takes place. The portion of value which does not return to labor, namely surplus value, allows the capitalist to exist, and it also allows him to do much more than simply exist. The capitalist invests a portion of this surplus value; he hires new workers and buys new means of production; he expands his dominion. What this means is that the capitalist accumulates new labor, both in the form of the living labor he hires and of the past labor (paid and unpaid) which is stored in the materials and machines he buys. The capitalist class as a whole accumulates the surplus labor of society, but this process takes place on a social scale and consequently cannot be seen if one observes only the activities of an individual capitalist. It must be remembered that the products bought by a given capitalist as instruments have the same characteristics as the products he sells. A first capitalist sells instruments to a second capitalist for a given sum of value, and only a part of this value is returned to workers as wages; the remaining part is surplus value, with which the first capitalist buys new instruments and labor. The second capitalist buys the instruments for the given value, which means that he pays for the total quantity of labor rendered to the first capitalist, the quantity of labor which was remunerated as well as the quantity performed free of charge. This means that the instruments accumulated by the second capitalist contain the unpaid labor performed for the first. The second capitalist, in turn, sells his products for a given value, and returns only a portion of this value to his laborers; he uses the remainder for new instruments and labor. If the whole process were squeezed into a single time period, and if all the capitalists were aggregated into one, it would be seen that the value with which the capitalist acquires new instruments and labor is equal to the value of the products which he did not return to the producers. This accumulated surplus labor is Capital. In terms of capitalist society as a whole, the total Capital is equal to the sum of unpaid labor performed by generations of human beings whose lives consisted of the daily alienation of their living activity. In other words Capital, in the face of which men sell their living days, is the product of the sold activity of men, and is reproduced and expanded every day a man sells another working day, every moment he decides to continue living the capitalist form of daily life. The transformation of surplus labor into Capital is a specific historical form of a more general process, the process of industrialization, the permanent transformation of man's material environment. Certain essential characteristics of this consequence of human activity under capitalism can be grasped by means of a simplified illustration. In an imaginary society, people spend most of their active time producing food and other necessities; only part of their time is "surplus time" in the sense that it is exempted from the production of necessities. This surplus activity may be devoted to the production of food for priests and warriors who do not themselves produce; it may be used to produce goods which are burned for sacred occasions; it may be used up in the performance of ceremonies or gymnastic exercises. In any of these cases, the material conditions of these people are not likely to change, from one generation to another, as a result of their daily activities. However, one generation of people of this imaginary society may store their surplus time instead of using it up. For example, they may spend this surplus time winding up springs. The next generation may unwind the energy stored in the springs to perform necessary tasks, or may simply use the energy of the springs to wind new springs. In either case, the stored surplus labor of the earlier generation will provide the new generation with a larger quantity of surplus working time. The new generation may also store this surplus in springs and in other receptacles. In a relatively short period, the labor stored in the springs will exceed the labor time available to any living generation; with the expenditure of relatively little energy, the people of this imaginary society will be able to harness the springs to most of their necessary tasks, and also to the task of winding new springs for coming generations. Most of the living hours which they previously spent producing necessities will now be available for activities which are not dictated by necessity but projected by the imagination. At first glance it seems unlikely that people would devote living hours to the bizarre task of winding springs. It seems just as unlikely, even if they wound the springs, that they would store them for future generations, since the unwinding of the springs might provide, for example, a marvellous spectacle on festive days. However, if people did not dispose of their own lives, if their working activity were not their own, if their practical activity consisted of forced labor, then human activity might well be harnessed to the task of winding springs, the task of storing surplus working time in material receptacles. The historical role of Capitalism, a role which was performed by people who accepted the legitimacy of others to dispose of their lives, consisted precisely of storing human activity in material receptacles by means of forced labor. As soon as people submit to the "power" of money to buy stored labor as well as living activity, as soon as they accept the fictional "right" of money-holders to control and dispose of the stored as well as the living activity of society, they transform money into Capital and the owners of money into Capitalists. This double alienation, the alienation of living activity in the form of wage labor, and the alienation of the activity of past generations in the form of stored labor (means of production), is not a single act which took place sometime in history. The relation between workers and capitalists is not a thing which imposed itself on society at some point in the past, once and for all. At no time did men sign a contract, or even make a verbal agreement, in which they gave up the power over their living activity, and in which they gave up the power over the living activity of all future generations on all parts of the globe. Capital wears the mask of a natural force; it seems as solid as the earth itself; its movements appear as irreversible as tides; its crises seem as unavoidable as earthquakes and floods. Even when it is admitted that the power of Capital is created by men, this admission may merely be the occasion for the invention of an even more imposing mask, the mask of a man-made force, a Frankenstein monster, whose power inspires more awe than that of any natural force. However, Capital is neither a natural force nor a man- made monster which was created sometime in the past and which dominated human life ever since. The power of Capital does not reside in money, since money is a social convention which has no more "power" than men are willing to grant it; when men refuse to sell their labor, money cannot perform even the simplest tasks, because money does not "work." Nor does the power of Capital reside in the material receptacles in which the labor of past generations is stored, since the potential energy stored in these receptacles can be liberated by the activity of living people whether or not the receptacles are Capital, namely alien property. Without living activity, the collection of objects which constitute society's Capital would merely be a scattered heap of assorted artefacts with no life of their own, and the "owners'' of Capital would merely be a scattered assortment of uncommonly uncreative people (by training) who surround themselves with bits of paper in a vain attempt to resuscitate memories of past grandeur. The only "power" of Capital resides in the daily activities of living people; this "power" consists of the disposition of people to sell their daily activities in exchange for money, and to give up control over the products of their own activity and of the activity of earlier generations. As soon as a person sells his labor to a capitalist and accepts only a part of his product as payment for that labor, he creates conditions for the purchase and exploitation of other people. No man would willingly give his arm or his child in exchange for money; yet when a man deliberately and consciously sells his working life in order to acquire the necessities for life, he not only reproduces the conditions which continue to make the sale of his life a necessity for its preservation; he also creates conditions which make the sale of life a necessity for other people. Later generations may of course refuse to sell their working lives for the same reason that he refused to sell his arm; however each failure to refuse alienated and forced labor enlarges the stock of stored labor with which Capital can buy working lives. In order to transform surplus labor into Capital, the capitalist has to find a way to store it in material receptacles, in new means of production. and he must hire new laborers to activate the new means of production. In other words, he must enlarge his enterprise, or start a new enterprise in a different branch of production. This presupposes or requires the existence of materials that can be shaped into new saleable commodities, the existence of buyers of the new products, and the existence of people who are poor enough to be willing to sell their labor. These requirements are themselves created by capitalist activity, and capitalists recognize no limits or obstacles to their activity; the democracy of Capital demands absolute freedom. Imperialism is not merely the "last stage" of Capitalism; it is also the first. Anything which can be transformed into a marketable good is grist for Capital's mill, whether it lies on the capitalist's land or on the neighbor's, whether it lies above ground or under, Boats on the sea or crawls on its floor; whether it is confined to other continents or other planets. All of humanity's explorations of nature, from Alchemy to Physics, are mobilized to search for new materials in which to store labor, to find new objects that someone can be taught to buy. Buyers for old and new products are created by any and all available means, and new means are constantly discovered. "Open markets" and "open doors" are established by force and fraud. If people lack the means to buy the capitalists' products, they are hired by capitalists and are paid for producing the goods they wish to buy; if local craftsmen already produce what the capitalists have to sell, the craftsmen are ruined or bought-out; if laws or traditions ban the use of certain products, the laws and the traditions are destroyed; if people lack the objects on which to use the capitalists' products, they are taught to buy these objects; if people run out of physical or biological wants, then capitalists "satisfy" their "spiritual wants" and hire psychologists to create them; if people are so satiated with the products of capitalists that they can no longer use new objects, they are taught to buy objects and spectacles which have no use but can simply be observed and admired. Poor people are found in pre-agrarian and agrarian societies on every continent; if they are not poor enough to be willing to sell their labor when the capitalists arrive, they are impoverished by the activities of the capitalists themselves. The lands of hunters gradually become the "private property" of "owners" who use state violence to restrict the hunters to "reservations" which do not contain enough food to keep them alive. The tools of peasants gradually become available only from the same merchant who generously lends them the money with which to buy the tools, until the peasants' "debts" are so large that they are forced to sell land which neither they nor any of their ancestors had ever bought. The buyers of craftsmen's products gradually become reduced to the merchants who market the products, until the day comes when a merchant decides to house "his craftsmen" under the same roof, and provides them with the instruments which will enable all of them to concentrate their activity on the production of the most profitable items. Independent as well as dependent hunters, peasants and craftsmen, free men as well as slaves, are transformed into hired laborers. Those who previously disposed of their own lives in the face of harsh material conditions cease to dispose of their own lives precisely when they take up the task of modifying their material conditions; those who were previously conscious creators of their own meagre existence become unconscious victims of their own activity even while abolishing the meagreness of their existence. Men who were much but had little now have much but are little. The production of new commodities, the "opening" of new markets, the creation of new workers, are not three separate activities; they are three aspects of the same activity. A new labor force is created precisely in order to produce the new commodities; the wages received by these laborers are themselves the new market; their unpaid labor is the source of new expansion. Neither natural nor cultural barriers halt the spread of Capital, the transformation of people's daily activity into alienated labor, the transformation of their surplus labor into the "private property" of capitalists. However, Capital is not a natural force; it is a set of activities performed by people every day; it is a form of daily life; its continued existence and expansion presuppose only one essential condition: the disposition of people to continue to alienate their working lives and thus reproduce the capitalist form of daily life. A good introduction to various Marxist concepts. The spring analogy is a little misleading though. Is There No Alternative, Perlman's statement simply says that price is the form of value through which value appears in exchange on a real market. This is perfectly consistent with Marx. It was also Marx's view that value has both a qualitative and a quantitative dimension (and therefore can be measured, i.e. by money). The entire argument at the beginning of chapter one of Capital is about finding the "common" property of commodities in terms of which they can be quantitatively compared. If 1 watch "equals to" or "exchanges for" 2 pairs of shoes, then obviously a quantitative comparison is made between them – a comparison in terms of socially necessary labor time. It is apt to be forgotten that the magnitudes of different things can be compared quantitatively, only when those magnitudes are expressed in terms of the same unit. It is only as expressions of such a unit that they are of the same denomination, and therefore commensurable. Just as motion is measured by time, so is labour by labour-time. [...] Labour-time is measured in terms of the natural units of time, i.e., hours, days, weeks, etc. Labour-time is the living state of existence of labour, irrespective of its form, its content and its individual features; it is the quantitative aspect of labour as well as its inherent measure. [...] Regarded as exchange-values all commodities are merely definite quantities of congealed labour-time. Value is (also) a quantitative magnitude.